It's hard to think that this CD is already Volume 5 in a series of recordings of music by Fritz Brun. After all, Brun is probably unknown to the majority of listeners - whether academics or plain music-lovers. If you realise that Brun was a Swiss composer, and that Guild is a Swiss record-company, this might offer some kind of explanation. The first four CDs in the series featured some of the composer's ten symphonies, while the present one comprises three of Brun's works for piano and orchestra. All in all they very much succeed in raising the profile of this seriously-underrated composer, who certainly merits wider recognition beyond his homeland. Composer, conductor and pianist Fritz Brun was born in Lucerne in 1878. His secondary-school-teacher father died when Fritz was just eight years old. After initial piano lessons, which also provided him with the much-needed facility to contribute to the family income by playing the harmonium in the local Penitentiary Church, Brun was awarded a scholarship to complete his musical studies in Cologne, Germany. He subsequently travelled to London, where he earned a living as a piano teacher and arranger of music-hall songs. Returning to Switzerland, he worked as an orchestral conductor and choral director, before finally retiring to his Lake Lugano villa, to concentrate on composing. The first work on the CD, Brun's Concerto for Piano and Orchestra, was completed on 20 May 1946, and is strongly linked with pianist Franz Josef Hirt (1899-1985), himself a native of Luzern, and who was the work's sole champion until his death some twenty-six years after the composer's. A contemporary review of Hirt's Zürich performance of the concerto on 13 January 1948 praises Brun not only for composing an excellent work amidst an apparently disappointing choice of other concertos at the same time, but also for having succeeded in integrating its solo part with the orchestra so as to satisfy both solo and symphonic demands. A Berne review of the same performance praised the work's contrasting 'burlesque ideas, gallant bows' and 'colourful, interesting twilight sections'. Of the slow movement, it read: 'Someone, who is capable today of withdrawing into such serenity to create such a beautiful sound world, should be really admired'. I am a great aficionado of the Romantic Piano Concerto per se, but one who would usually not find too much to write home about in a work composed roughly half-way through the last century. I was rather intrigued, following the Berne critic's appraisal of the Andante sostenuto slow movement, at least to see what Brun's concerto was all about. The work's opening is a surprise already - the piano gives out the principal theme unaccompanied, marked 'semplice' (simply) by the composer, and is in no way full of virtuosic octaves, but somewhat more akin to the gentle start of Beethoven's Fourth Piano Concerto. Even in the opening twenty seconds or so, before the orchestra joins in, Brun has something individual to say. This he delivers in a unique manner, encapsulating, somewhat, the spirit of what is ultimately to follow - save for the later technical difficulties of the first and third movements, which apparently caused Hirt to have 'bleeding fingers'. The work has a stylistically-eclectic nature, but one which is firmly homogenised and integrated. Here is no Neo-Romantic anachronism or pastiche, as the rest of the opening Allegro moderato confirms. The extremely attractive slow movement is a model of concise scoring, in which pairs of (solo) violas, cellos and basses open with a longer, chorale-like introduction, before the piano joins in. Here Brun later makes a particularly effective use of solo clarinet. The ensuing Rondo finale is traditionally cast, but very effectively rounds the work off. It seems that there are no metronome markings at all, leaving it up to soloist and conductor to interpret the composer's concise Italian tempo instructions and arrive at the ideal speed throughout. This is something they achieve absolutely unfalteringly. The Variations for String Orchestra and Piano on an Original Theme consist of a set of eight variations that follow each other without break, except in the case of short pauses occurring after Variation 4 and 6 respectively. Brun has already shown masterly skills in this particular genre, in the Chaconne of his Fifth Symphony, and the Finale of his Sixth. He appears to favour sequences of contrasting variations, rather than the slowly-progressing or cyclical variety. The most important is Variation 7 (Largo - espressivo), which stands as a slow movement, and is considerably longer than the preceding ones. It's only just a little shorter than the final Variation 8 - itself a fairly intricate fugue. At this juncture it is interesting to examine the titles used by the composer for the three works recorded here. Normally, where German is being used, the usual word for piano is 'Klavier' - hence 'Klavierkonzert' for 'Piano Concerto', rather than 'Konzert für Pianoforte .' - true, 'Pianoforte' exists in German, but is not usually the first word of choice. Brun was from the German-speaking part of Switzerland, so this might account for this slightly uncommon usage - however, it does not really affect the symphonic balance or weighting between piano and orchestra. On the other hand the word order is significant in this second work on the CD - these are Variationen für Streichorchestra und Klavier ('Variations for String Orchestra and Piano'), which suggests the work is conceived as a concertante piece, where the piano is the principal instrument, rather than the out-and-out prima donna it can be in a regular showpiece concerto. This is not to diminish the piano's role or importance in the work, but to emphasize that both forces are seen more as equal protagonists in the musical argument. The final variation is a good example of this balance, especially with its unpretentious ending. In the last piece, another similar concertante work for piano and orchestra, Brun restores the solo instrument to pole position, with the title of Divertimento für Klavier und Streicher ('Divertimento for Piano and Strings'). The work, while continuous, effectively divides into five sections, basically alternating quick with slow. The penultimate Lento (slow) section - an extended episode which opens with a lengthy string introduction - is the most beautiful section of the work as a whole. Certainly more enigmatic than the other two works recorded, conductor Adriano's advice that 'It must be heard at least twice before our ears can enjoy it with relaxation and even with a certain sense of humour' is especially sound, and particularly as the ending simply seems to creep up on the listener with such alacrity that you wonder whether you've missed anything in the lead-up. Once more, the title gives a little further insight into the work - it is for 'Streicher' ('Strings'), rather than 'Streichorchester' ('String Orchestra') like the Variations - and imparts it with a definite chamber-music quality. This is seen only in Brun's other somewhat similarly-scored isolated Piano Quintet movement, which dates from 1902, some fifty or so years earlier. 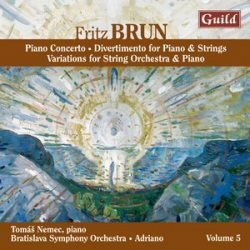 If you've never heard any music by Fritz Brun, I urge you to do so, and there is surely no better vehicle than this superbly-presented CD of works for piano and orchestra. Every aspect is first class - the playing, both from the Bratislava Symphony Orchestra and fellow-Slovakian soloist Tomáš Nemec, to the outstanding and faithfully-captured recording. Add in Adriano's immense contribution, not only as conductor, but also in providing the most extensive sleeve-notes - and which have further been carefully anglicised by Ian Lace - and you have a CD that should not only introduce Brun's distinctive style, but in a total package than surely cannot fail to delight. There is also a Sterling CD of Symphony No. 3.